An undercover investigation is taking place on the mysterious Psychical Examination and Research Group, where four eminent men are involved in Satanic rituals. The agent is discovered and killed, but not before he manages to deliver his report to his superiors, which includes five photographs, one each of the four men and a fifth which appears to be blank. As an expert in the occult, Professor Van Helsing is called in to help the enquiry. He suspects that the fifth picture should have been that of Dracula, who cannot be photographed. His search for his arch enemy leads him to reclusive businessman D.D. Denham, who is in fact Dracula. Now, Van Helsing discovers, the evil Count is planning to spread a lethal plague and destroy all life on earth, at the same time taking his personal revenge on Van Helsing by turning his granddaughter, Jessica, into a vampire and making her his bride for all eternity! Well, it had to happen eventually. After years of growing disillusionment, Christopher Lee’s patience finally ran out and after this film he vowed never to play Dracula again, unless it was as a faithful interpretation of Bram Stoker’s original character. It was 1978 before the film was finally released in the US by an almost unknown distributor, Dynamite. Joanna Lumley had played a Bond girl opposite George Lazenby in “On Her Majesty’s Secret Service” (1969). She later became Purdy in ABC TV’s “The New Avengers”. More recently, she has become even more successful in television and films, with roles in productions such as “James and the Giant Peach” (1996) and the smash hit BBC TV comedy series “Absolutely Fabulous”. 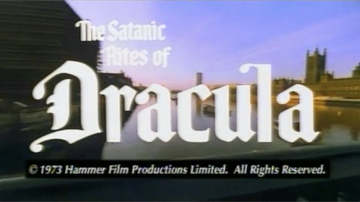 This was director Alan Gibson’s last film for Hammer. He died in 1987.